Yesterday my friend Julie and I had a day of dyeing using all the onion skins, avocado skins and pips, ripe olives, puffballs, and Euc. 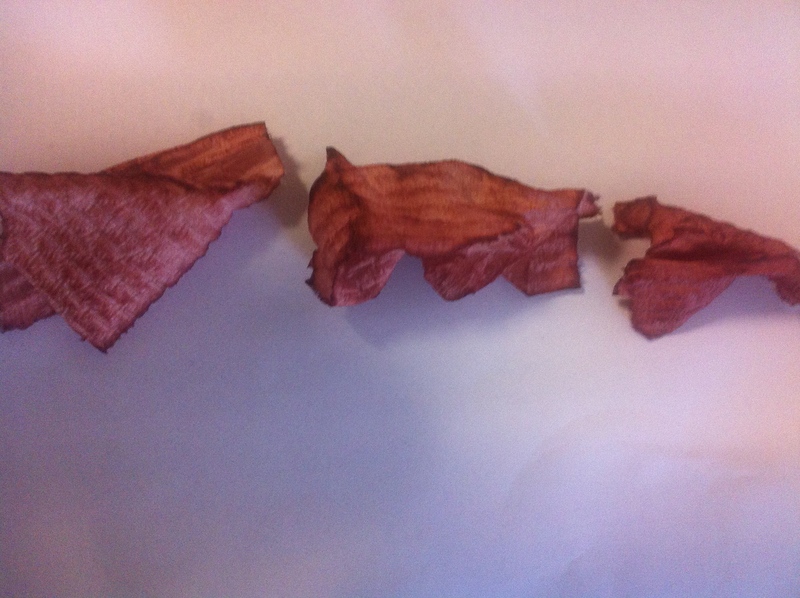 wandoo bark and leaves we’d each collected. The day went so well we had a second day today and I’ve just put a whole lot of wrapped bundles under a “plastic tent” in the back hoping I’ll forget about them. If I do forget them, they’ll have a nice long time and maybe even some sun to develop good markings. 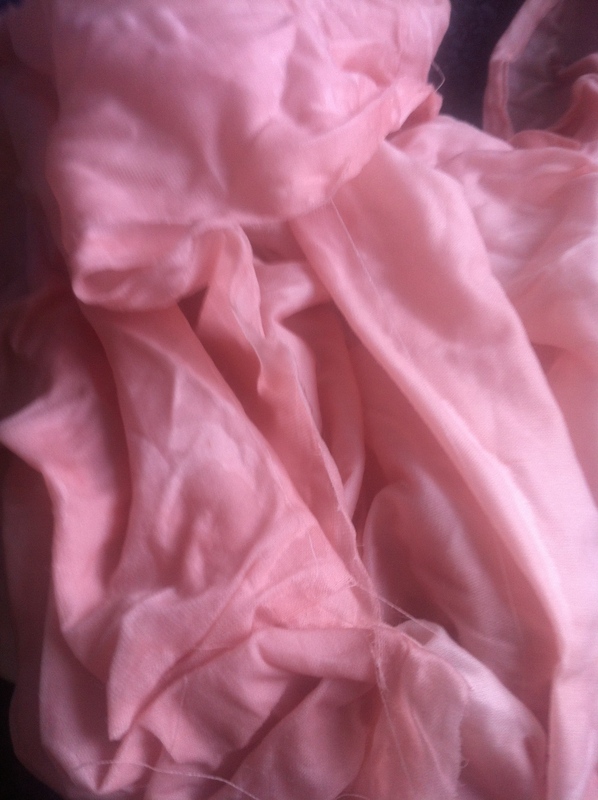 I’ve tried avocado pips before and even when I’ve frozen them immediately after I’ve scraped out the flesh, I have found I only get pale pink on silk and cotton. So this time before I submerged my 12 pips in water I googled. Thanks to “Hooked and Dyed” at http://hookedanddyed.com/2014/05/28/natural-dye-avocado/ I found a good tip. Add a teaspoon or so of soda ash to raise the pH while simmering and if necessary add more if the pH falls while dyeing. 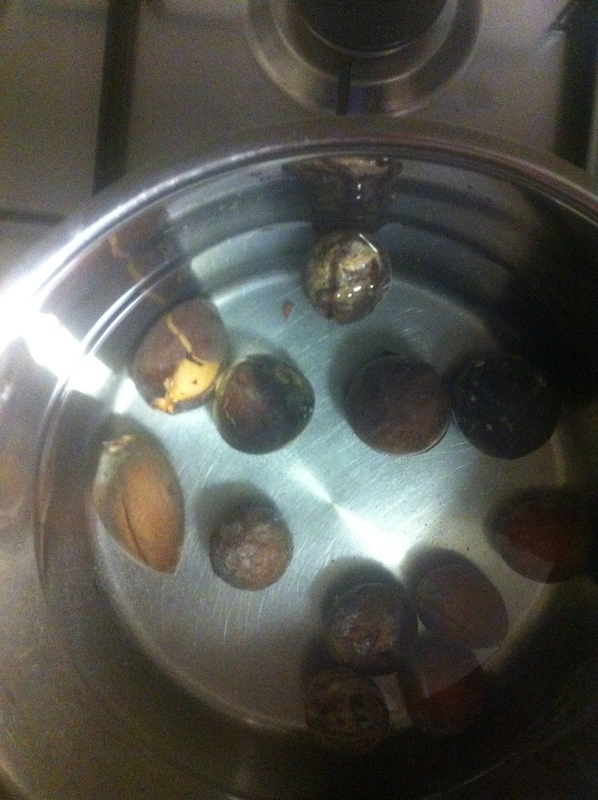 Pips in water before heating but with 1 heaped teaspoon of soda ash added. 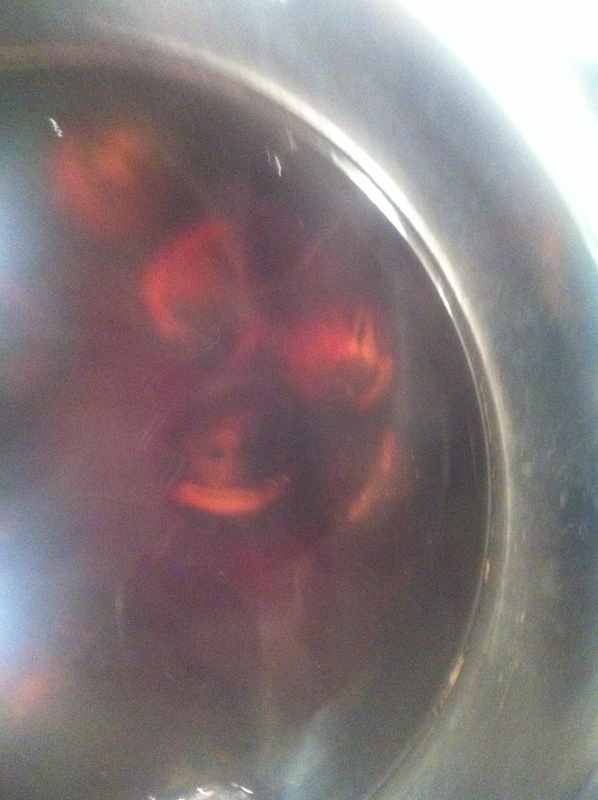 The pips have gone red within ten minutes as the water starts to steam. Pieces of kitchen paper dipped in the solution after 15 , 30 and 45 minutes of simmering respectively. The fabric I added to the bath was 20% silk and 80% cotton. This is it on the sink before rinsing (still wet). I remembered too late that such a high level of cotton content warranted pre-soaking with soda ash! I’ve since soaked that fabric and dyed it again in the avocado pip bath. It is now “resting” under plastic and hopefully weak winter sunshine for a few weeks. Fingers crossed. I wondered how a piece of 100% silk would go in the same bath. Silk tied and wrapped before adding to the avocado pip bath. 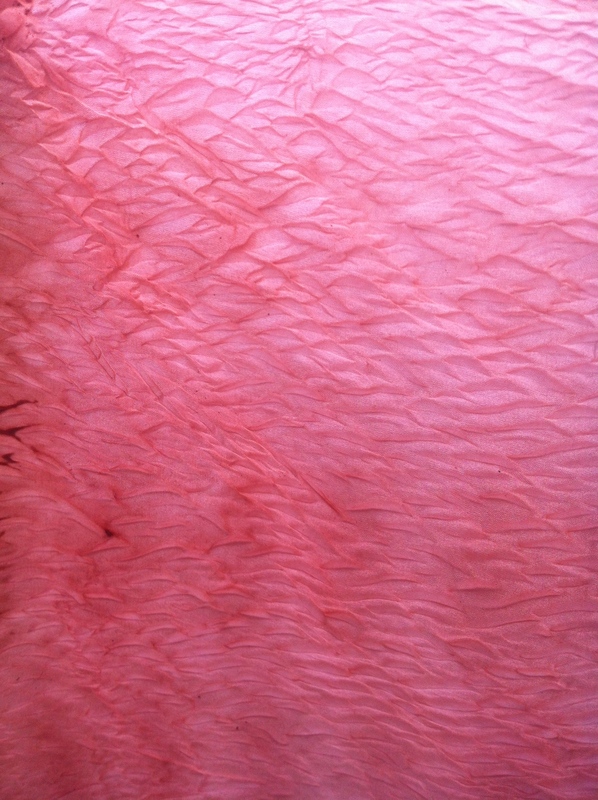 The silk was removed from the bath and allowed to sit overnight to cool before unwrapping. 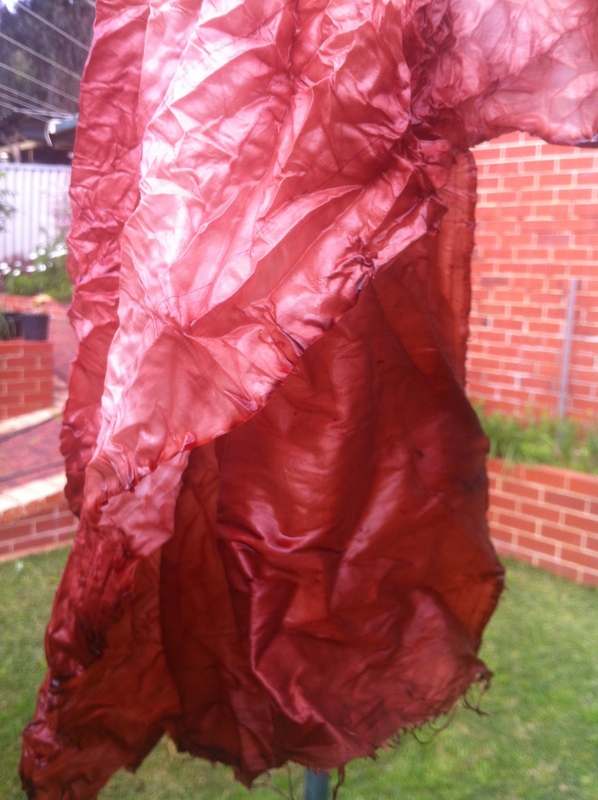 It’s a bit darker but still disappointing compared with the appearance of deep colour in the dye bath. 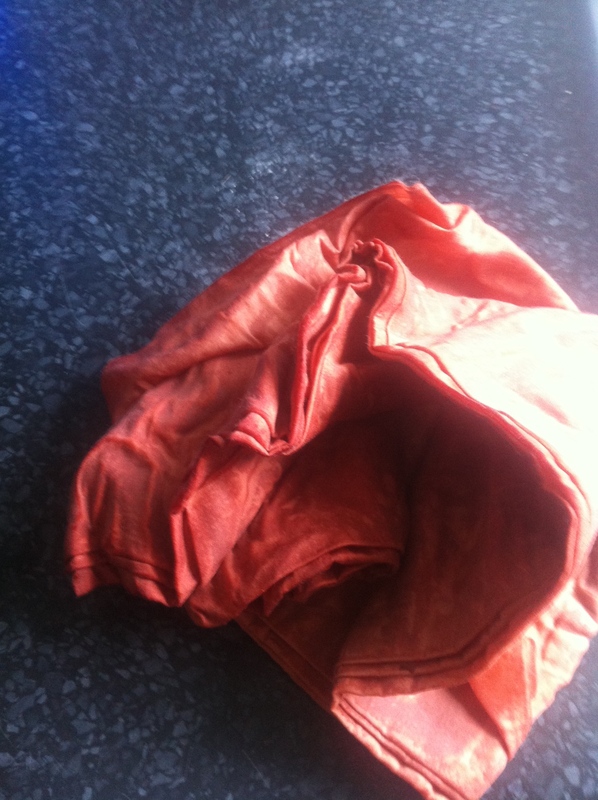 However, Julie fared better with a large piece of yummy and heavier dupion silk. 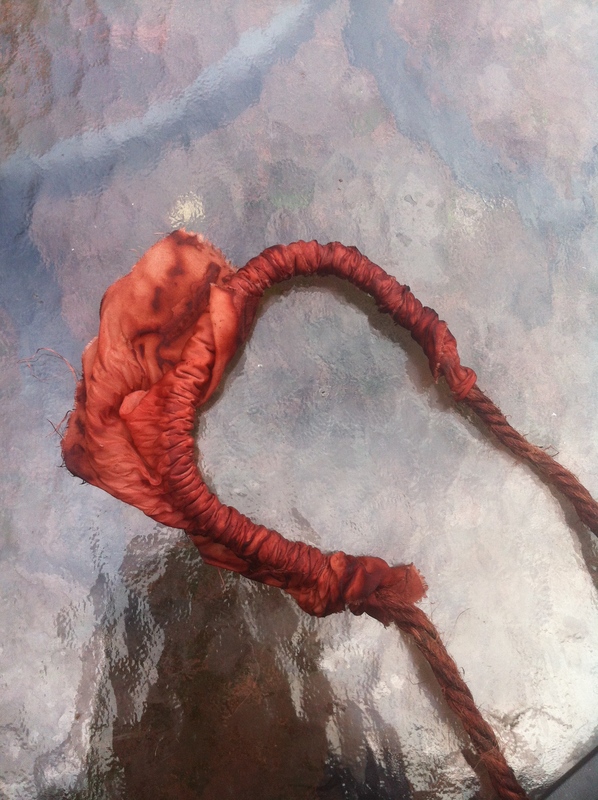 My friend Julie’s dupion silk which was in the same bath. Clearly increasing the pH is a factor. Weight seems to be a factor also. It remains to be seen whether the pieces of soda ash soaked cotton I have left to rest outside will have an improved depth of colour. I must buy a pH testing kit though! 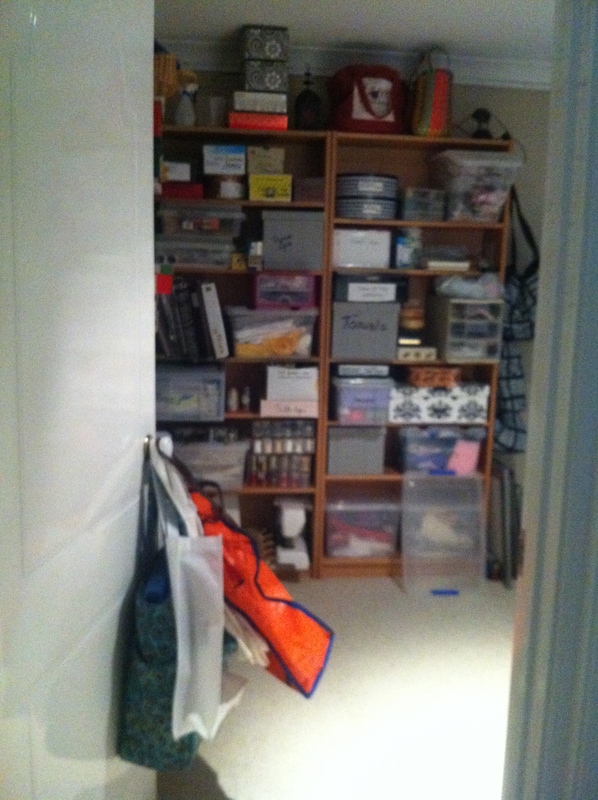 BTW, here is a photo of my tidied sewing room, just to show that the crocheted hat did not terminally distract me! Hey, there’s a floor here! These are all gorgeous – look forward to seeing the “tented” piece. That sounds wonderful – hope they try that next time. Was a great couple of days Margaret. Certainly the avocado pips batch was a great result. Might try that with a few other things too. Also looking forward to seeing some of the steamed prices.